We love little more than connecting fascinating friends with one another. So, it is with great pleasure that we introduce you to PerpetualExplorer.com, the newest member of the YourLifeIsATrip.com family. A few months ago Stefanie Singer, the editorial director at The Perpetual Explorer, a multicultural website about global exploration, suggested a collaborative relationship to introduce YourLifeIsATrip.com storytelling to PerpetualExplorer.com travelers, and vice versa. Today, Yourlifeisatrip.com and Perpetualexplorer.com, announce a new partnership that merges our mutual passions for global exploration and the stories that bring these experiences to life. The partnership will see YourLifeIsATrip.com tapping into PerpetualExplorer's.com's rich archive of articles, photos and videos, selecting and hosting those that best reflect and enhance the interests of the YourLifeIsATrip.com community. The first piece of PerpetualExplorer.com coverage that we're showcasing is 'Ganesh Chathurthi Celebrations in India'. This locally reported article tells the story behind the Hindu god, Ganesh Chathurhi, and the annual festival that is enthusiastically celebrated (mid-August to mid-Septemeber) across India. We'll be featuring a new story each month from the site, so check back often. Additionally, you can find featured PerpetualExplorer.com stories on our home page sidebar. Or if you just can’t wait, go to the source! Read the official partnership press release, here. Everyone loves to WIN, and YourLifeIsATrip.com wants to bring the WINNER'S smile to your face. From November 11-20, 2010, we'll be GIVING AWAY one of our author's books each day. From the jungle tribes of Papua New Guinea and buying art in a Mexican prison to internal voyages of self-discovery and the digital world of storytelling, the featured books have subjects as diverse as the authors themselves. All you have to do to win is sign up to receive the FREE YourLifeisATrip.com newsletter, 'like' us on facebook, or become a new twitter follower, and you're automatically in the random drawing. Daily winners will be announced on YourLifeIsATrip.com, on our facebook and twitter accounts, and at the close of the contest. If you enjoy YourLifeisaTrip.com, we encourage you to use the links below to share the contest on your facebook page, give us a shout out on twitter, link, blink and a free book can be yours. Good luck!! November 12, 2010: Life Is A Trip: The transformative magic of travel by Judith Fein. This month, we’re continuing the recent award celebrations with the exciting release of co-founder and editor Judith Fein’s new book, LIFE IS A TRIP. Let's make Judie's book a bestseller! Buy LIFE IS A TRIP right now at THE TRIP SHOP powered by Amazon. We created YourLifeIsATrip.com as a place for writers to share their stories about the transformational magic of travel. Now, with the release of LIFE IS A TRIP, Judie takes the dream one step further. We couldn’t be more excited! YourLifeIsATrip.com was recently honored with two first-place writing awards from the Western Chapter of the Society of American Travel Writers (SATW). The site won Gold awards in both the Travel Blog and Revenue Producing Website categories. The Western Chapter of SATW (www.satw.org) includes travel editors, writers and public relations representatives in 13 western states. Now in its 55th year, SATW is a professional association whose purpose is to promote responsible journalism, provide professional support and development for members and encourage the conservation and preservation of travel resources worldwide. And while we're breaking out the bubbly... Did you know that contributor Rachel Dickinson's YourLifeIsATrip.com article 'Stalking Karl Rove' was chosen as one of "Eight Great Travel Writing Samples" in a recent panel discussion at the Travel Blog Exchange (TBEX) 2010 conference in NYC? Congrats, Rachel! We’re thrilled by the number of YourLifeIsATrip.com contibutors winning recognition for their writing. Listed below are just a few recently announced awards celebrating YourLifeIsATrip.com super stars. Not one, but TWO, YourLifeIsATrip.com writers, Andrea Gross and Jules Older, took home awards for excellence in travel journalism in the category of 'Internet Reporting' at the 13th Annual Northern Lights Awards. The competition is open to magazines, newspapers, independent writers, photographers and Internet reporters in North America who have generated tourism-oriented coverage on Canadian destinations in 2009. And just in from Elyn Aviva. Her upcoming story "The Camino: The Journey Within and Without" (pub date May 11, 2010) is a finalist and will be published (in Spanish) in the anthology 'Peregrinas por el Camino de Santiago'. We KNEW we were fortunate to feature such talented writers, but apparently we're not alone in our appreciation. Well done, gang! We invite you to join the fun - post a comment, become a subscriber, catch up with us on Twitter or Facebook, or share YourLifeIsATrip with your friends and social networks. We love it when we can pass along an opportunity for free travel. Even better when it's a reward for persuasive writing! So, if you (or anyone you know) are planning to tie the knot, check out this opportunity for eco-conscience brides and grooms from the USA and Canada to win the wedding of their dreams in the Cook Islands. The winning couple also gets to bring along four family/friends to celebrate! 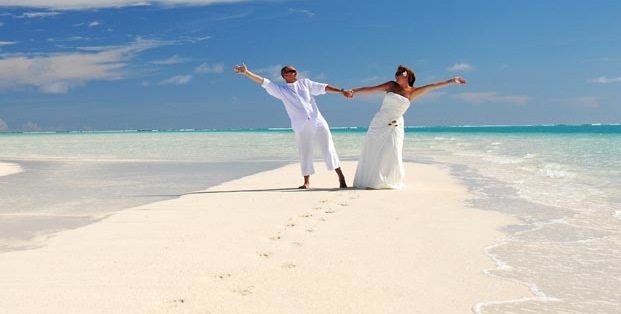 Prizes includes roundtrip airfare on Air New Zealand from Los Angeles to the Cook Islands, accommodation for the bride/groom plus four guests, and an eco-friendly wedding ceremony and reception including South Pacific traditions. From the presentation of story and article ideas, meeting regional contacts, guidance on editorial positioning, exploring major trends in writing and publishing in freelance markets, gain professional support, guidance, and camaraderie at TRAVEL & WORDS 2010 (June 26, Tacoma, WA). Attend workshops and seminars on marketing freelance articles and photography to both print and online publications in the Pacific Northwest and beyond. Gain timely information on changes and trends in the freelance writing world, particularly the use of social media in managing and marketing one’s brand and developing income-producing web sites related to travel writing. Make valuable connections with editors and travel and tourism industry professionals who highlight Pacific NW destinations, including Oregon, Washington, Idaho, Alaska, and British Columbia.